It can’t be denied, despite unpossibles simple style, it’s also extremely pretty. 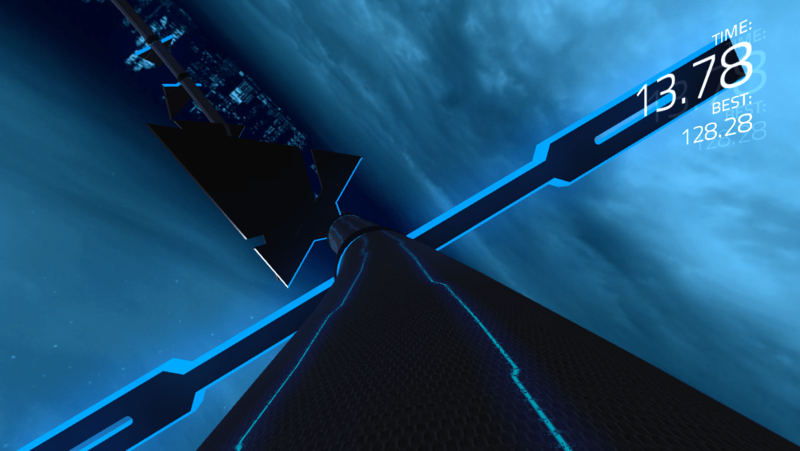 The skybox is beautiful, and allows for you to enjoy the style of the level you play. Given the nature of the game I’m currently developing, I decided it was time to delve into the mobile app market to see what competition is in the market, and what innovative/original ideas were out there. 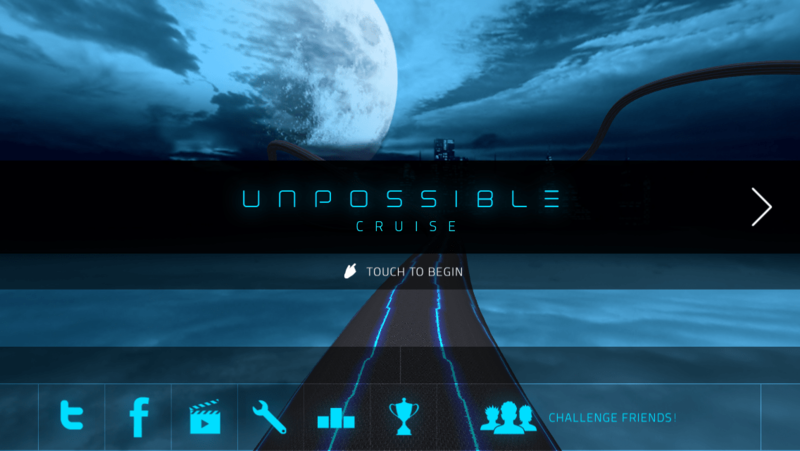 Whilst browsing, I came across a nifty little app that I liked the trailer of called Unpossible, an obstacle avoider game, similar to my own, which had a unique sound track and slightly different course structure in that you’re on a never ending tube that generates obstacles on the outside. Usually, tubing games stick you on the inside, so this definitely made the game stick out for me. Levels start out easy, with obstacles being fairly easy to pass, but the difficulty soon ramps up, with obstacles coming at you faster than you can move to avoid them. The game starts you off on a tube where you’re constantly moving forwards, throwing obstacles at you which you need to avoid by strafing left and right around the tube. You’re stuck to the outside, so you don’t have much room to navigate, but it’s enough to keep the game tight in gameplay whilst also being loose in controls. You can choose to strafe by either touching either side of the screen, or by rotating the device to the side you’d like to move. I personally went for the touch controls as I felt they gave me more precision when navigating between lots of obstacles. 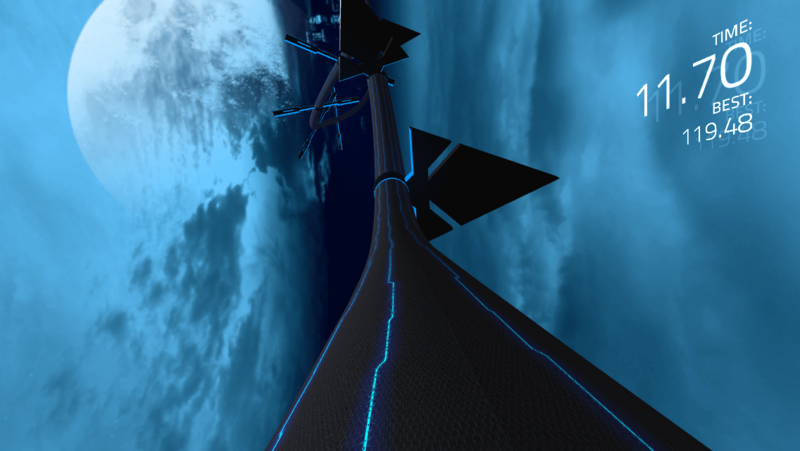 The levels begin easy, with big pilons sticking out of the tube allowing 90% of the tube to avoid them, but they soon get faster, and the obstacles start grouping together, meaning that it becomes harder and harder to avoid them all. The difficulty I could say is inconsistent, with early levels being so easy you breeze through it and get scores of 2 minutes and over, with the second level ramping up the difficulty to the point I could rarely reach 30 seconds. This isn’t a detraction from the game, and if anything, adds to its addictive behaviour, but can become infuriating for many players looking to beat their friends on the scoreboards. Although the levels may be hard, they can start to become a bit predictable, allowing you to know the patterns and how to avoid them. I was eventually able to get high scores on each level, but it takes a lot of trial and error. The game consists of 3 levels, and 3 daily levels, meaning the game doesn’t offer much in terms of content. Where it makes up for this though is its replay-ability, ensuring players replay levels time and time again until they finally beat their last score. It’s not as addictive as say… Super Hexagon, as there are times that you feel cheated like it was impossible for you to avoid something no matter what you done, but the game still allows you to become hooked to some extent to constantly strive for a better score. For £1.49, I certainly learnt a lot about my current competition on the market, and it makes me want to improve myself and my work for my upcoming game Twixel, with my game needing to be polished to Unpossibles level of detail. For £1.49, you really can’t go wrong with this addictive little game, and I must warn you: the soundtracks absolutely fantastic.